Many technology companies are now focused on a new kind of method for making sense of data: artificial intelligence, machine learning, deep learning, natural language processing, and others. 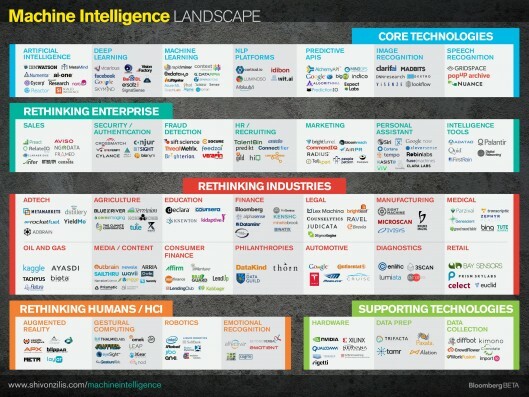 This machine intelligence world has recently exploded and is transforming existing industries and also likely creating entirely new ones. To make sense of this world, Bloomberg Beta‘s Shivon Zilis spent the last 3 months researching more than 2,500 startups and created a Machine Intelligence Landscape. She found that enterprises, industries and humans are all being augmented by machine intelligence. Big companies will have a disproportionate advantage since they have the massive datasets and user interactions, but Shivon sees the technology they develop rapidly spilling into other areas, particularly as startups take the core technologies being developed into niche use cases. With input from several of portfolio companies and colleagues, the comprehensive landscape serves as a primer on the state of the industry, defining the various implications for entrepreneurs and investors. See the landscape and Shivon’s findings here. Bloomberg, the global business and financial information and news leader, gives influential decision makers a critical edge by connecting them to a dynamic network of information, people and ideas. The company’s strength – delivering data, news and analytics through innovative technology, quickly and accurately – is at the core of the Bloomberg Professional service, which provides real time financial information to more than 315,000 subscribers globally. For more information, visit www.bloomberg.com.